Order Chicks Now! Click here for our 2019 Poultry Order List. 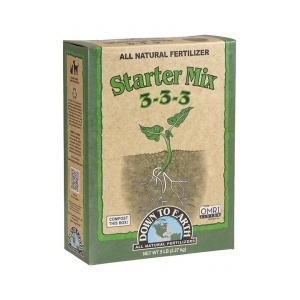 Down To Earth starter and transplant formula is the perfect way to get your delicate young starts and new seedlings in the ground and ready to thrive. In addition to essential primary and secondary plant nutrients we've added a diverse mix of beneficial soil microorganisms to ensure successful planting, expansive root development and vigorous early season growth. Ingredients: Alfalfa Meal, Fish Bone Meal, Bat Guano, Feather Meal, Langbeinite, Oyster Shell, Greensand, AZOMITE, Kelp Meal, Mycorrhizal Fungi and Beneficial Bacteria. © 2019 Nescopeck Agway. All rights reserved.